I'm not in the habit of saying "I told you so", but this time I can't resist. Back in 1999, when Jenny Shipley's tired and frightened National Government decided out of the blue to reduce the legal drinking age to 18, I predicted it would lead to immense social problems. Whether the idea was to woo 18 and 19-year-old voters or to ensure that the fabulously wealthy booze industry fronted up with loads of cash for the upcoming election campaign I don't know. But I do know that on the consciences of that Parliament's conscience voters is a legacy of thousands of deaths, injuries and broken lives among this nation's teenagers. In 2006/2007, 23 per cent of drinkers of alcohol aged 15 years and over had a potentially hazardous drinking pattern. Since I pay $120-odd for a carton of 200 cigarettes, I don't see why a bottle of whisky, gin, brandy, rum or whatever shouldn't be at least the same price, considering its potential to do far greater damage. It's potential? Good God. Imagine if taxes started being applied based on the potential of products or services to cause harm. The paper suggests a health warning on liquor labels and that, too, has been suggested here from time to time. Once again, what is sauce for the cigarette is sauce for the booze bottle (or can or carton). Oooh he's grumpy. Silly Mr George. You see, when you call for state interference and force against what you hate - alcohol - you have to wear it against the things you love - tobacco. A bit of a pact with the devil. 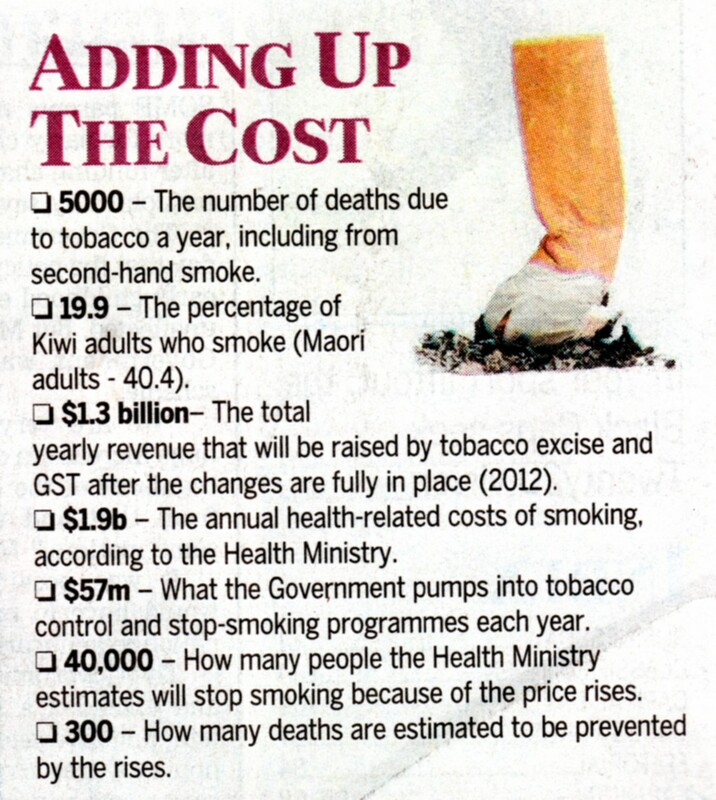 H3) What are the economic and other costs of smoking? This is blatantly about building public support for tax hikes and turning non-smokers against smokers who have apparently overnight incurred a 760 percent increase in their health bill.
. . . I have a fundamental belief that governments should leave people alone, and that the role of the state should be relatively small, and that the state should not be in you life more than it needs to be. New Zealanders have this natural aversion to being told what to do by governments, both local and central, and I’m pretty much in that camp. A 2002 study estimated that tobacco spending made up 14 percent of low income non-housing budget. Rates of smoking are highest amongst the most deprived. Tobacco taxes are therefore regressive. That means they create a disproportionate burden on the poor. On the back of this hike, a few people will give up smoking . 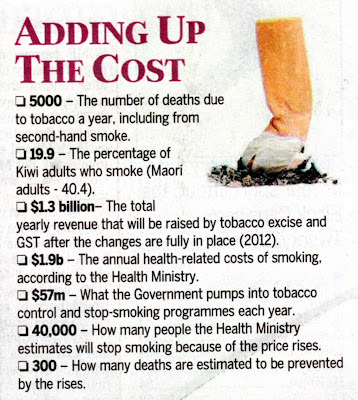 According to the NZ Medical Journal for a 10% price increase, the demand would fall in the long term by 0.7% to 5.2%. But the vast majority will not. They will cut spending elsewhere or get deeper in debt. The deeper in debt they get the more worried and depressed they will get and the more they will want to smoke. Vicious circle stuff. Next time you hear a politician - except for the 4 ACT MPs who voted against the hike - spinning a sob story about under-taxing the rich and over-taxing the poor remember this particular plundering of the already impoverished. Well done to the 4 ACT MPs who didn't vote for a tax increase on cigarettes and tobacco products. But who was the ACT MP that did? The report is 208 pages long and I think the journalist covering it must have gotten tired about mid-way through. I certainly did. But I was looking for the whole story. 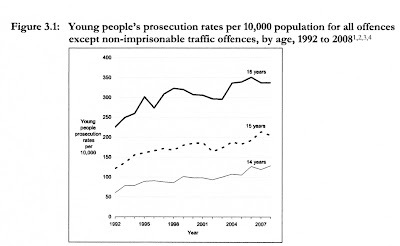 So significant increases in the rates of prosecution. 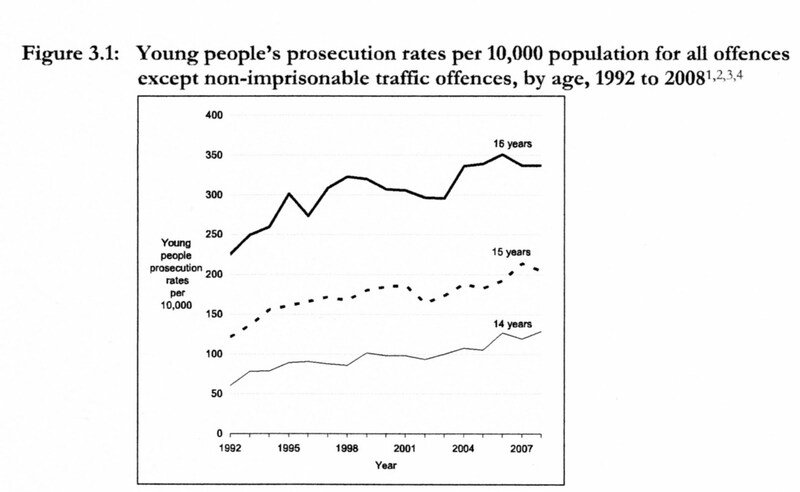 This backs up the increasing severity of offending seen in apprehensions. Of course no report about crime would be complete without some ethnicity analysis. Therein lies a shocking picture. Yes. 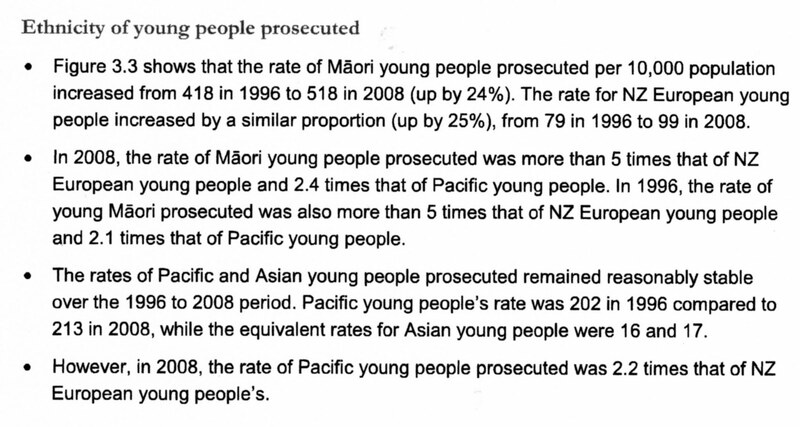 I am still shocked by the disparity between European and Maori in so many sets of social statistics. 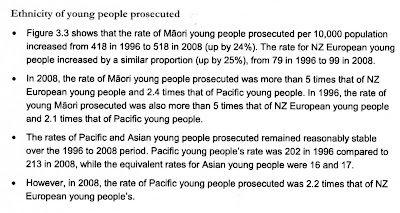 1 in 20 young Maori is prosecuted in court compared to 1 in 100 young European. So the overall picture looks like this. Principal Youth Court Judge Andrew Becroft said the statistics punched a hole in the popular perception that youth offending was "spiralling out of control". 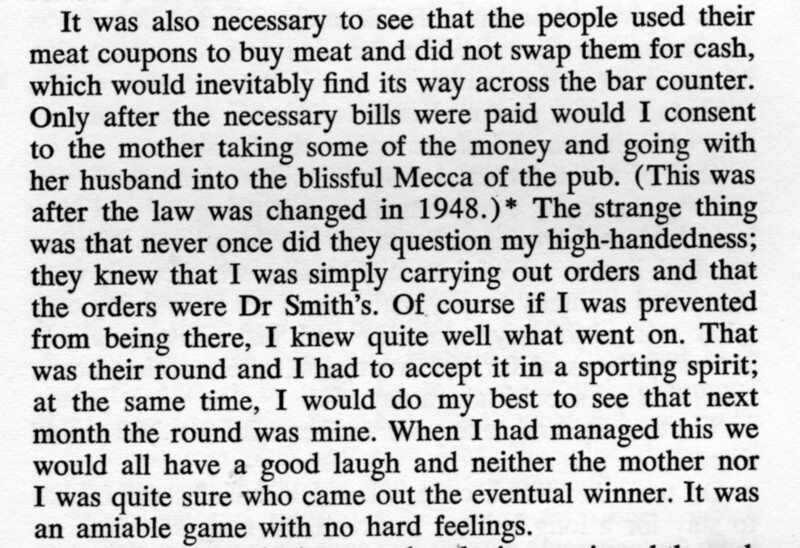 John Armstrong writes that political parties abrogate their collective duty by allowing conscience votes on drinking laws. He obviously approves of the born- again temperance brigade writing that we live in "conservative times". ...Its recommendations aside, the commission's big challenge to Parliament is its call to end conscience votes on alcohol-related measures. The commission is dead right. Conscience votes on such legislation have traditionally been granted to MPs on the grounds that drinking is a matter of personal morality. This is a charade which allows parties to abrogate their responsibilities on things like the drinking age where public opinion unpredictably waxes and wanes on raising or lowering it and the politics get too difficult. Parties should act as a body and predictably on matters they have campaigned on. Did National campaign on reversing alcohol consumption laws? Did it campaign on removing conscience votes? John Armstrong is only taking this line because it suits his position on the issue. Labour's gay MPs have been told to take a back seat to prevent critics accusing the Government of pandering to the "pink vote". And she [Helen Clark] has stressed this is ultimately a conscience measure and thus Parliament's decision, not the Government's. It hardly adds up to a rip-roaring celebration of the measure's intent. But both Helen Clark and David Benson-Pope, the minister in charge of the bill, have kept their nerve, not least because the left faction in the Labour caucus will be furious if they buckle. 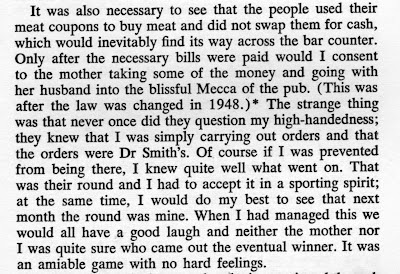 So nerve was kept in this instance but lost when it comes to alcohol laws. There are very good reasons why parliament has conscience votes on moral issues. They are too important to relinquish. There is a report in The Press claiming that 50 percent of drugs are being wasted. That wouldn't be happening if they were recreational drugs notice. Try to envisage people turning up to tinnie houses with bags stuffed to bursting with unused cannabis. No. It is too silly. First, 50 percent seems high when I do a mental check of my own medicine cabinet. 10 or 20 maybe, but then that's just my family. There are valid reasons why medicines remain unused. Death. Often people are on massive amounts of medication at the point of death. Recovery. Some medicines should be taken as a whole course but many will do the job and no more is needed. Over zealous prescribing. Patients can be very passive and let a GP prescribe for them medicines that they have no intention of taking. Bad reaction. Sometimes the patients rightly or wrongly perceive a bad reaction to a drug and stop using it. And there are other things that come to mind which lead to waste. The rules around pharmaceuticals and dispensing. Over cautious best-by dates. The non-recyclability of returned medicines. And of course subsidies. Human nature is such that often people do not value what they do not pay for. There-in lies the paradox. The state makes medicines more accessible so that people's health is preserved and they do not become an economic cost at the secondary level. But by doing so, waste taxpayer's money at the primary level. So the waste of pharmaceuticals is, to some degree, a product of taxpayer subsidy and unnecessary bureaucracy. Death and recovery are immutable factors. Subsidy and over-regulation are not. As a former comptroller of the US, David Walker noted in 2007: "There's something civil servants have that the private sector doesn't. And that is the duty of loyalty to the greater good - the duty of loyalty to the collective best interest of all rather than the interests of a few. Companies have duties of loyalty to their shareholders, not the country." There is something else civil servants have that the private sector doesn't. And that is access to funds that are guaranteed through the force of the state. Their jobs do not rely on producing either a good or service that customers will voluntarily meet the cost of. I hope at some future date Tapu Misa is going to write a column slating private ownership of the media because companies only serve the interests of a few and profits go offshore. She could cite her own employer as an example. Deborah Coddington says Paula Bennett, despite being "not unintelligent", comes across as "a bit of a bint." I confess I had to consult a dictionary to confirm the meaning of bint which is a 'not too bright' woman. This is, according to Deborah, because of the content of her speech. For example, she (and John Key) over-use the word 'actually'. We are all too familiar with lazy speech. Like, er, like, basically, it's er sort of, well, actually, like that. Absolutely, awesome (never with the -ly), piss poor communication. I must just drop in a story here. My son's cousin knows a girl who goes to my son's school. The cousin asked her if she knew Robert. The girl replied, "He's that guy that uses big words that nobody can understand". Now that tickled both Robert and I. Robert uses interesting language because he reads a lot. Her inability to understand him isn't his problem. It's hers. Robert isn't about to change to accommodate her because he likes words. Yesterday I had cause to say to him "For goodness sake you," to which he quickly retorted "Don't you 'for goodness sake you' me," which instantly dispelled my annoyance. Anyway here's the guts of it. We speak like the people we live with and spend time with. My message to the children is, don't use that word when there is a better one available. Don't overuse words until they lose all meaning. Don't swear often. Save your cursing for when it really matters, otherwise what will you have when the need arises? The English language is rich. I have a responsibility to use it fully and sometimes, painstakingly. The way I communicate with my children is more important in my view than the way I feed them. The way I converse with my husband rubs off on them enormously. But we are not conformists. We don't try to be like other people. The degradation of language and communication is a product of conformism and, a phenomenon Theodore Dalrymple identifies; the conformism is going in the wrong direction. A physical analogy is tattoos. Once a mark of lesser educated working-class men, now so-called intelligent middle class women flock to affect them. It is a sad fact that some politicians are downward conformists, not only because that is their inherent nature, but because they think it will buy votes. I agree with Deborah Coddington. It's not good enough to say, speak how you like; that's freedom of expression isn't it? It's just evolving culture isn't it? 'I'm a Westie and proud of it'. No. Freedom of thought and freedom of expression rely on the ability to think and communicate. Language is the tool by which we achieve both. I am sick of the dumbing-down process. Never have I said so before because 'dumbing down' is, of itself, one of those hackneyed overused phrases. Apparently IQs are rising as the world becomes wealthier. If so, it's not particularly apparent. Some of the worst displays of ungrammatical, grating, dull and repetitive language appear in and around sporting endeavours, from both commentators and players. Many times I have cursorily reflected to myself, all brawn and no brain (naturally a 'gender neutral' comment for those academics who do possess healthy linguistic repertoires, but nonetheless fill their written and oral communications with woolly concepts and overladen sentences). Still, the players at least use their physical abilities to best effect. The same cannot be said for commentators. And it cannot be said for politicians. Which brings me back to Paula Bennett. If there is merit in having an ex-beneficiary Maori single mother as Minister because she represents realised aspiration, then why not try to inspire people further? For any politician, there is no shame in being articulate. It is a sad indictment if politicians are merely there to reflect ordinariness and lack of ambition - the characteristics that often go hand-on-hand with low-grade communication.